Recycling bins are coming soon to every room in Burnam Hall at Eastern Kentucky University, thanks to a grant from Keep America Beautiful and the Coca-Cola Foundation. The grant will fund the acquisition of 200 color-coded containers, which will allow residents to separate aluminum, plastics and paper. As part of the pilot project, some rooms will receive two bins, while others one. Patrick McKee, sustainability manager for the University, said he believes the convenience of the bins will make recycling simple and easy for students in Burnam Hall, adding that the inclusion of recycling in the “home environment” for these students will also help to create behaviors that “stick” after graduation. “If it goes well in Burnam, we plan to expand the program to other halls very quickly,” McKee said. In 2015, EKU contributed an estimated 2.6 million pounds of landfill waste. At the same time, it recycled almost 12,000 pounds of plastic bottles and almost 200,000 pounds of paper. For years, the University’s collection of aluminum cans has gone to the Novelis aluminum recycling facility in Berea. Novelis offers a 50 percent match and makes a donation to Habitat for Humanity[MP1] . EKU’s contribution alone has helped purchase enough building materials for four Habitat homes, according to Randy Wilson, program coordinator with Facilities Services. Keep America Beautiful and Coca-Cola are working together to address one of the primary barriers to recycling in public spaces by making access to recycling bins more readily available and convenient through its Public Space Recycling Bin Grant Program. In total, the program will provide 3,522 recycling bins to colleges and universities, along with 996 bins to local governments and nonprofit organizations. 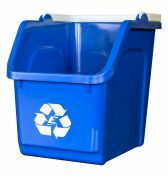 More than 45 percent of the bins are designed specifically for permanent, ongoing use in public spaces such as athletic fields, K-12 schools, fairs and festivals, special events and park settings, with the remaining 55 percent to be used by students in college residence hall settings. The 2016 program is expected to result in an estimated 1 million pounds of recyclable materials collected during their first year in use. Including the 2016 grants, over 49,000 recycling bins will have been placed by the program in 925 communities nationwide since its inception in 2007. In addition to the grants, Keep America Beautiful provides technical best practice guidance to grant recipients and organizations about setting up effective away-from-home and on-the-go recycling programs. Grant recipients were chosen by Keep America Beautiful based on their potential to collect the most cans and bottles, as well other considerations such as the extent of their need, recycling experience and their ability to sustain the program in the future. A full list of the 2016 Coca-Cola/Keep America Beautiful Public Space Recycling Bin Grant recipients and Keep America Beautiful’s best practices guide, “Designing Effective Public Space Recycling Programs,” are available at bingrant.org. Behavioral research has shown that two of the primary barriers that stop people from recycling are the lack of convenient opportunities and confusion about what and how to recycle. A 2009 study conducted by Keep America Beautiful showed only 12 percent of surveyed public locations had infrastructure to recover recyclable items. This lack of recycling opportunities is reflected in a separate national survey conducted for Keep America Beautiful in 2013, in which 92 percent of respondents said they recycle at home while only 41 percent indicated that they typically recycle in public spaces. In addition to providing more convenient opportunities to recycle, thegrant helps to address the issue of confusion by providing bins that incorporate recognized best practices for bin design and labeling. Established in 1953, Keep America Beautiful provides the expertise, programs and resources to help people end littering, improve recycling, and beautify America’s communities. The organization is driven by the work and passion of more than 620 community-based Keep America Beautiful affiliates, millions of volunteers and the support of corporate partners, municipalities, elected officials, and individuals. To donate or take action, visit kab.org. Follow Keep America Beautiful on Twitter, Instagram, Facebook, or YouTube. The Coca-Cola Foundation is the global philanthropic arm of The Coca-Cola Company. Since its inception in 1984, the Foundation has awarded more than $820 million in grants to support sustainable community initiatives around the world. For more information about The Coca-Cola Foundation, visit www.coca-colagivingback.com.